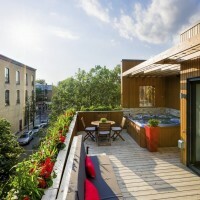 MU Architecture have completed a two storey apartment located above a restaurant in Montreal, Canada. 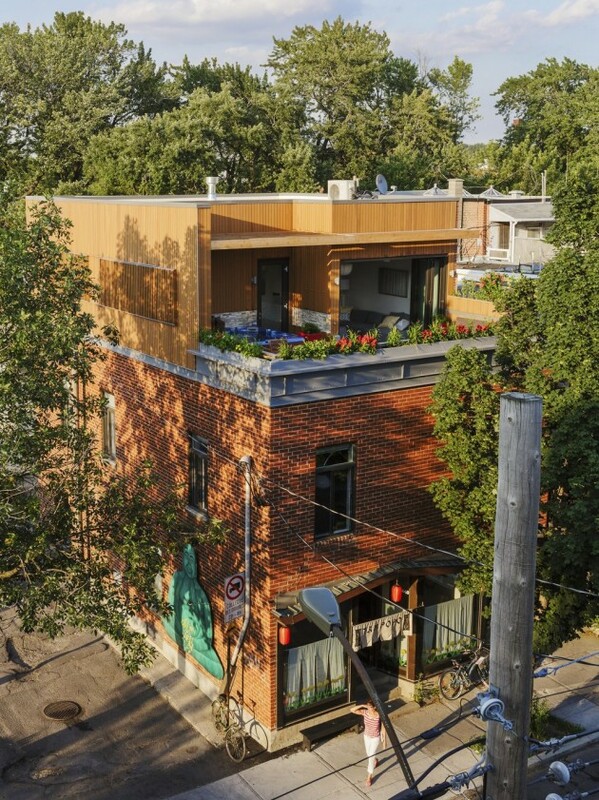 This residential project has been specially designed by MU Architecture to be in harmony with the style of the original red brick worker’s residence. The building required a significant structural intervention in the basement to straighten the skewed frame and support the new mezzanine. 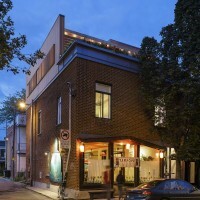 In addition, the ventilation system of the restaurant had to pass through the floor and occupy much of the existing roof. Therefore, it was necessary to carefully conceal the shaft within the volume of the new addition. The main access stair leading from the street to the first floor was extended into a second staircase leading to the mezzanine. 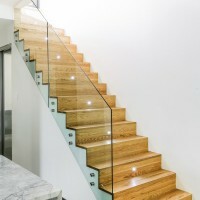 The stair treads and risers consist of a folded solid wood plane, while a single sheet of tempered glass serves as the guard rail. On the first floor, the original structure wall was replaced by a single beam system creating a large, bright and open area. The fully white kitchen brings light and depth to the space while integrating with the white walls of the residence. The fireplace is covered with a layer of blue steel, blending perfectly with the polished concrete of the radiant floors and contrasting the bright white kitchen cabinets and doors. 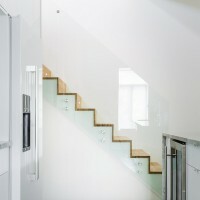 The wooden staircase offers a touch of warmth and comfort in this sleek white universe. 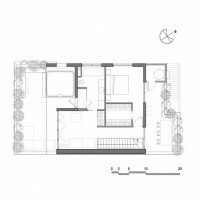 Upstairs, the master bedroom and its walk-in directly communicate with a small but spacious terrace facing east. 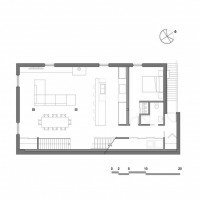 It features a dinette area, a BBQ and a storage module that conceals the mechanical ventilation of the ground-floor restaurant. The main area of the floor, a lounge, opens onto a large terrace, oriented to enjoy the sun throughout the day. 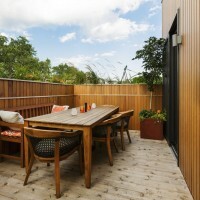 The floor and railings of both terraces are wrapped in select cedar planks. 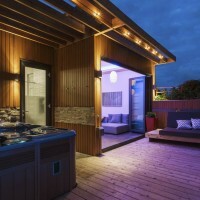 Set in a recess of the main terrace, protected from the wind and views and covered with a wooden pergola, a Jacuzzi tub connects directly through a glass door to the shower in the main bathroom. Integrated within the new steel cornice, a plant and flower box act as the main railing that is designed to securely anchor the addition to the existing building. On the side of the building, in continuity with the cornice, a long steel section marks the transition between the existing building and the new addition. 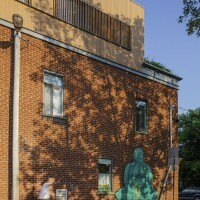 The result is a monolithic cedar planked volume that rests atop the existing building. The north side, overlooking the alley, is perforated by a set of vertical slats which provides the necessary light inside the room while maintaining privacy. 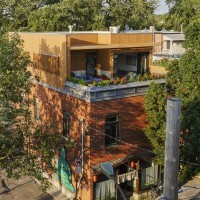 For this project, MU Architecture decided to use raw materials left in their original state. 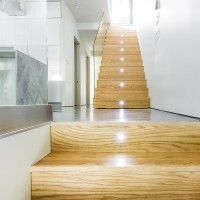 The radiant concrete floors, wooden staircase, and cedar planks blend together in harmony.